‘After that magic run in Port Alfred a few weeks ago I was on call on the Monday, we had a heavy one, admitting over 40 patients. There was a public holiday on the Wednesday Heritage day, or braai day as South Africans prefer to call to it. The weather was not conducive to braaing, I spent it indoors studying. The next day after work I managed to drag myself out for a lazy 16km run, then I was on call again on Friday. I spent most of Sunday studying and getting to grips with a topic that had been on my mind quite a bit. That being sepsis. A little while before on call I had looked after a patient in sepsis. Sepsis is as bad as things can get for the body. It describes a continuum from systemic inflammation to multiple organ failure. The underlying cause in most cases is an infection (bacterial, fungal or viral although we always look for bacterial first). At the mild end of the spectrum is the systemic inflammatory response syndrome (SIRS) where one can find a very high or very low white cell count (WCC) (WCC >12 or WCC < 4; normal range is 4-10), fever or hypothermia (body temperature >38ºC or <36ºC), tachycardia (an increased heart rate) and tachypnoea (an increased respiratory rate). Moving up the spectrum (with increasing severity and mortality) there is hypotension (a decreased blood pressure) and some form of organ dysfunction (kidney failure for example). This is severe sepsis. When the hypotension is refractory (not responding to treatment) this is referred to as septic shock. Multiple organ dysfunction syndrome is at the extreme end of the spectrum. On 16 September we saw a patient on call that I assessed to be in sepsis or some degree thereof. He was a 47 year old man HIV positive with a very low CD4 count, clinically wasted, confused and incoherent. The intern reported that the blood pressure was 80/40. “Put up a second IV line for fluids and draw blood for blood cultures” I instructed. I also thought that by the looks of him that he would possibly need a lumbar puncture. We also started him on antibiotics. After an hour or so the blood pressure had not improved. With the accompanying tachycardia and his generally poor state although I didn’t have any blood results yet I started thinking about sepsis. I wanted to use a drug to help increase his blood pressure but wasn’t sure exactly how to. I had prescribed dobutrex (dobutamine), an inotrope (increases strength of contractions of the heart) for refractory hypotension before but that is a drug used in cardiac cases. I called the consultant on call and when I mentioned sepsis he said we needed to do blood and urine cultures (this is to find the source of the infection) and give a broad spectrum antibiotic. We had given a stat 2mg dose of rocephin (ceftriaxone) already but he suggested adding flagyl (metronidazole). Regarding the haemodynamics we needed to be aggressive with intravenous crystaloid fluids via two IV lines he said. We had two IV lines up but they were both peripheral, we needed at least one central line. We had already given him 2 litres of ringer’s lactate IV, and “I want to step up to a vasopressor maybe” I said. 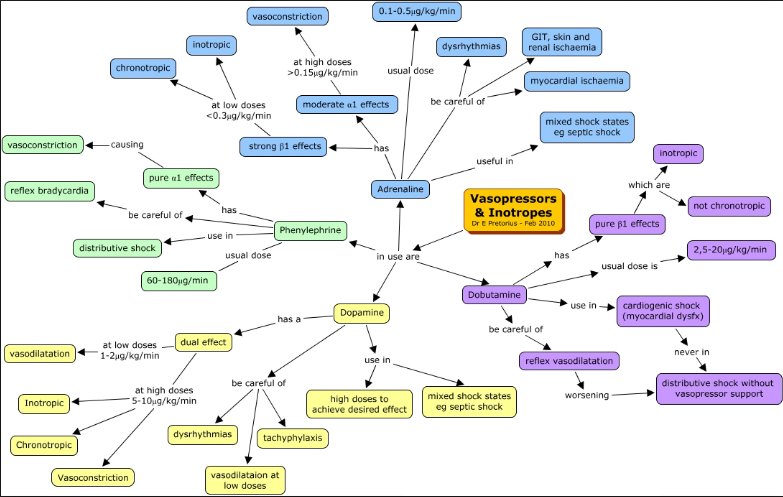 A vasopressor causes constriction of peripheral blood vessels (vasoconstriction) increasing the pressure against which the heart has to contract. “The first choice in a case like this is noradrenaline, but we don’t have that you’ll have to use dopamine” he said, and he quoted me the dose. “Keep me updated of any further changes” he said before we hung up. 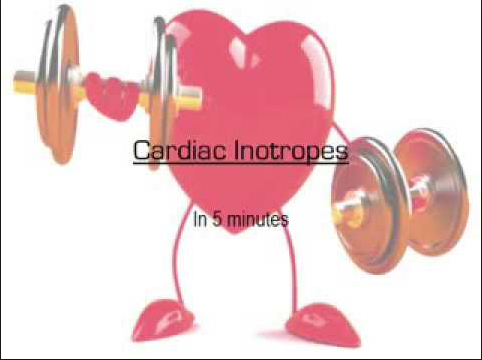 Dopamine is a catecholamine, it has the effect of increasing the strength of contraction of the heart as well as the heart rate, and it also causes peripheral vasoconstriction, all of which help increase blood pressure. A 10mcg/kg/hour infusion had his blood pressure up to a much better 110/70 eventually. The goal is a mean arterial pressure of 70mmHg or more. It remained good, as long as we kept the infusion going. The reason one fusses about the low blood pressure is that at such a low level the heart is essentially failing to get blood (with oxygen and other essential nutrients) to the organs around his body. This is the definition of circulatory shock. 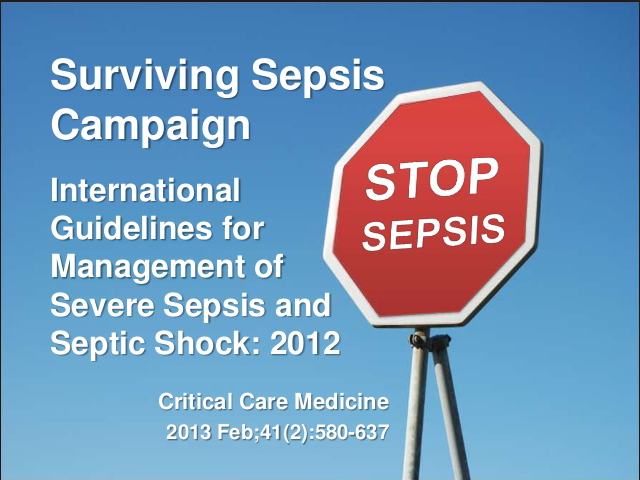 The Surviving Sepsis Campaign started in 2002, is an international initiative that provides regularly updated evidence-based guidelines on how to diagnose and manage sepsis. 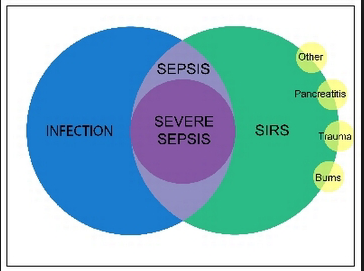 We go according to these, or as close we possibly can in our approach to sepsis. That is what I spent that Sunday 28 September pouring over. 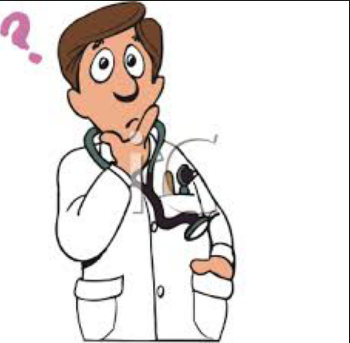 “Why internal medicine?” an interns asked me the other day. “It suits my brain” I replied. I like to think my way through problems, slowly. Internal medicine is complex, all the systems affect one another. What’s happening in the lungs has an affect on the function of the heart, and cardiac dysfunction affects the kidneys. You can’t consider a patient’s liver function in isolation, and similarly kidney disease can cause changes in the blood pressure. All these systems and the different ways things could go wrong and what you need to do to help the patient I find really interesting. There is a hec of a lot to know, it is a vast field but I am super keen to get into it. I get ‘patient envy’ when I hear of an interesting case that another doctor has seen, I sit at the weekly internal medicine meetings at LVH and I’m in awe of the registrars and specialists because they know so much, and are so capable of making real change for sick patients. I am still at the beginning of my journey, I have been qualified for less than 3 years and there is a lot I don’t know yet. I definitely want to take it as far as I can. The CEO of our hospital has agreed to let me do the full year of my community service in internal medicine, I won’t have to change departments after the end of this month (this is my sixth month) I’m really happy about that. It will mean more time and exposure to the discipline. Onto more important matters, that of the rugger! 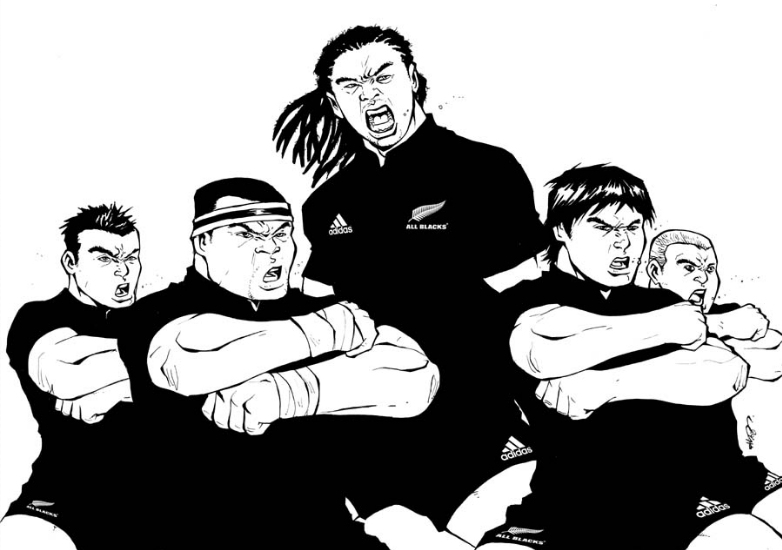 😛 The New Zealand rugby team (the All Blacks) is the best in the world, up until 2 weekends ago the last time they had lost a test match was in 2012! The South African rugby team (the Springboks) are ranked number 2 in the world. The All blacks are the only team in the world against whom South Africa has a negative win-loss ratio and conversely whenever New Zealand loses a game (this doesn’t happen very often) it is more likely to be against the Boks than anyone else. So this is a serious rivalry. 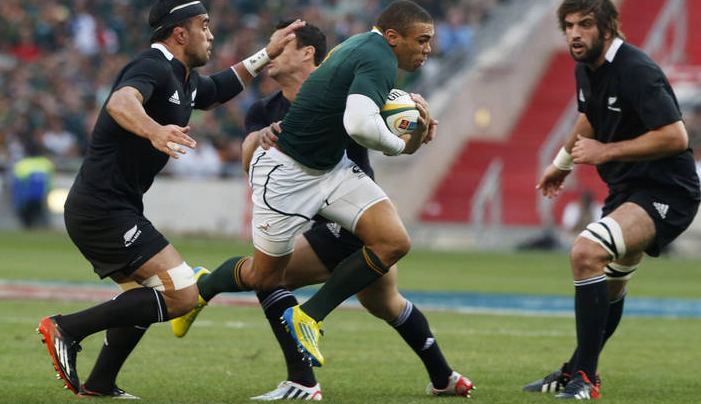 South African wing Bryan Habana running rampant! The call was not too busy on that Saturday we had 24 admissions, none of whom were in sepsis thankfully 😛 There was one lady that was very distressed, in congestive heart failure with pulmonary oedema. This is when the ‘left heart’ is failing to pump blood out to the body, there is a build up of pressure in the pulmonary vein and smaller vessels feeding into it from the lungs. Simply put, the pressure pushes fluid out of these vessels into the lung tissue. Oxygen by facemask and large doses of IV diuretics are the way to go about managing these patients. I was quite worried about her but she pulled through. I saw her during the week as she was in my ward, she became less oedematous (fluid overloaded) with the diuretic therapy and I discharged her after a few days. It was nice to see her get better.